A regulator is a device that can control the pressure to a certain extent in case of a sudden fluctuation of gas flow and moderate it. ۱.The loading part consists of a weight, spring, gas pressure. The regulators are available in spring-loaded and Pilot Regulator-operated models. In pilot-controlled regulators, the output pressure changes is compared with spring force to the other pilot’s regulator, and the result is applied as gas pressure to the main regulator diaphragm, in other words, the output pressure changes are strengthened and then the prevents the change at valve. Pilot is a spring-loaded regulator that feeds on the input pressure and provides the output pressure in proportion to the compression ratio of the spring. The pressure is applied as the steering pressure on the main regulator. The technical characteristic that is important in selecting regulators is their capacity, which is directly related to the input and output pressure and the gas density and its body shape, so that the ratio between the input pressure (P1) and the output pressure (P2) determines the type of output flow from the regulator. And if P2 <P1/ 2 then the flow is absolute critical, and if P2 = P1 / 2, the flow is critical and if P2> P1/2 the flow will be noncritical. The requlator capacity is easily calculated for different pressures based on the above equation and available tables. A regulator is a device that decreases the high gas pressure in a cylinder or a process line down to a lower pressure. The regulator should be fitted with the type of used gas. For example, for oxygen gas, which is a flammable gas and quickly reacts with fat, the regulator must already be degreased and the effect of gas on the metal body of the regulatormust be considered for the corrosive gases. The place of installing the regulator: Is the regulator installed on the cylinder either in the process line or on the manifold? Each of these cases affects the selection of the regulator. Input pressure to regulator: It depends on the source pressure of the gas, and it must be proportional to it. Output pressure: It depends on the consumer’s needs. 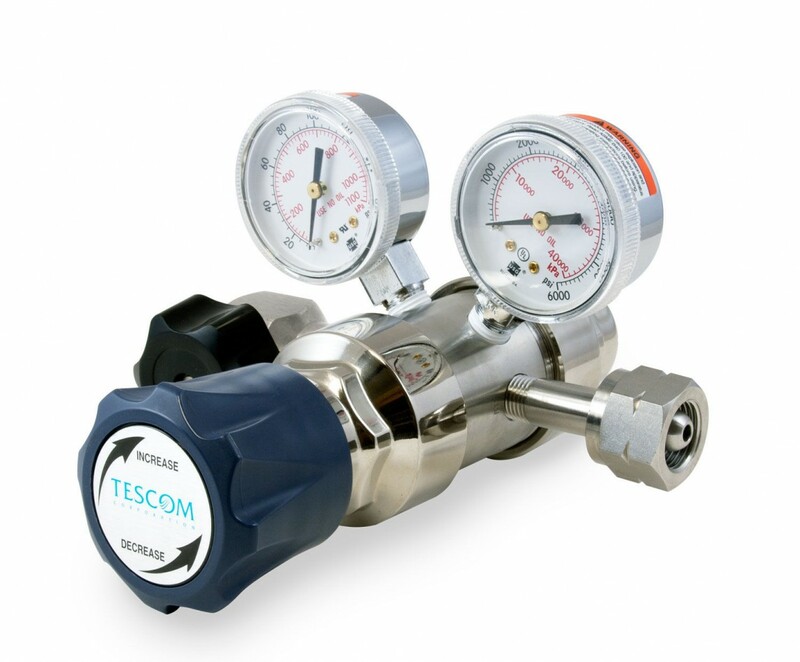 The number of pressure gauges and their accuracy: Often, 2 gauges are used on the regulator, one of which shows the input pressure and the other shows the output pressure, and the gauge measurement range should normally be greater than the desired pressure. The functionalaccuracy of the regulator at the output (single-stage, double-stage or the gas regulatorprecision): This depends on the consumer’s requirements. Type of the regulator input and output connections: Input connections depend on the gas supply connections (if it is a cylinder, then it will depend on the type of valve) and the output connections depend on the consumer connections. The possibility of purging to increase the safety and useful life of the regulator and the entire gas control system by a neutral gas such as nitrogen, especially when the gas used in the regulator is corrosive or toxic. Regulator material: It Depends on the type of used gas. The following table shows the compatibility of the metals used in the gas regulator.